09-10-2012 • Categories: Events, Jobfeed, Match! 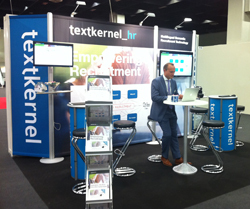 For the fifth time in a row Textkernel exhibited at Zukunft Personal in Cologne. Textkernel presented the new products: Match! and Jobfeed Germany. Visitors could also test Match! in Jobfeed. With just one click, Match! converts a job ad into a search query and matches this directly to the database. The enthusiasm of our visitors confirmed the need for a good user-friendly matching software. Are you interested in our revolutionary matching technology? Read more about Match! or directly request a demo.